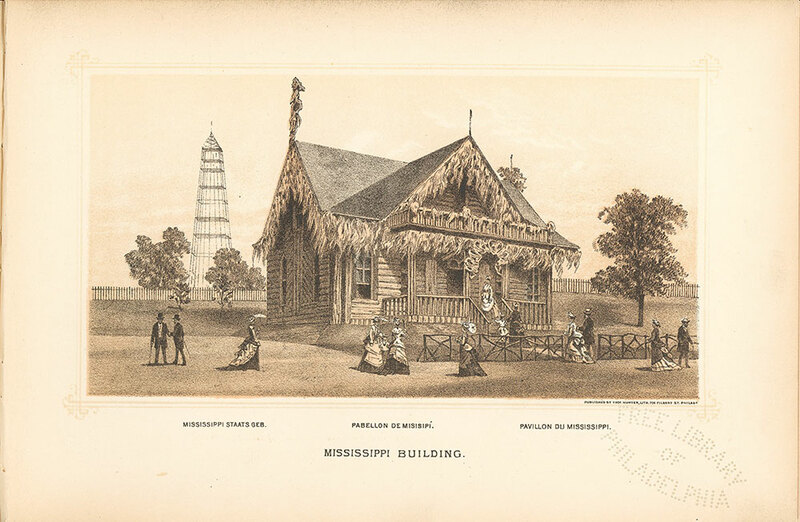 Notes: "Mississippi Staats Geb., Pabellon de Misisipi, Pavillon du Mississippi." Rudest in external appearance, homeliest in interior fitting up and furnishing, the building of the State of Mississippi challenges attention by the contrast which it presents with the gay and fanciful structures around it. Whilst the arts of the carpenter, the cabinet-maker, and even of the upholsterer, have been brought to aid in the embellishment of the mansions in which most of the States receive their citizens, Mississippi displays no more of the builder’s art than need be exercised by the emigrant who pitches upon a homestead in the shadows of the woods, and whose residence is a simple log cabin which he himself, although uninstructed in architectural mysteries, can fabricate. The State receives her visitors in a rude shelter which suggests the earliest style of home known to her settlers. Her accommodations are comprised within a space of 40 x 30 feet. The situation is in the north-western portion of the Centennial enclosure, west of the Japanese building. The outside walls are chiefly of hickory split logs with the bark on. The door-frames and window-frames are made of different qualities of pine. The doorway affects the Gothic as much as can be done, by the meeting at the centre of two logs rising at slight pitch. The panels of the door are intended to display the great variety in the character of the native woods of Mississippi, those portions of the structure being made of 48 different varieties. The eaves overhang the walls and the porticoes, and they are fringed with long Spanish moss, which forms so constant a pendant from the great trees which line the banks of the Mississippi River. This substance is arranged in picturesque style, and adds greatly to the rural character of the building. The balcony is supported by pillars made from the limbs of trees, rustic and of such shapes as nature has permitted, whilst the capitals are gnarled and grotesque knots and roots fantastic in arrangement. The interior is fitted up with native woods; upon the inner walls, smooth and polished, so as to show the grain and natural color. Pine predominates, but there is great contrast even in that product, which varies in appearance and quality according to the species and portions of the trees from which they were taken, not only in the grain and shadings, but in the substantial color. There are 68 kinds of woods in the interior, distinct from those in the panels of the doors, so that the timber treasures of the State are here shown in 116 varieties. The ornaments of the interior, brackets and other adjuncts are as the forests furnish them, and add to the general interest of the structure. All the timber used in this house came from Mississippi. Carpenters, citizens of the commonwealth, came with it, and have erected this unique and picturesque cabin. The commissioners from Mississippi are accommodated here. Residents of the State are welcomed, and strangers from all parts of the United States and of the world are courteously received and afforded opportunities to see and examine for themselves. Notes: The Building, situated in a grassy field with a fence in the background. People stroll in the foreground.